If you can’t stand the heat, get out of the kitchen. 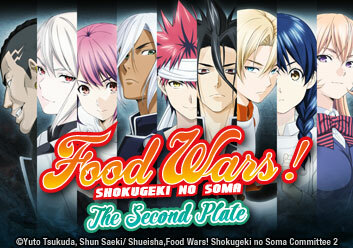 Soma Yukihira is back, and he’s raring to get into the culinary fray once again! In battles where the weapons are sumptuous flavors, vivid scents and argent passion, Soma will have to stay knife-sharp as he competes against the world’s most elite student chefs at Totsuki Academy. Soma must stay connected to his love for cooking as the competition reaches a boiling point, and surprises simmer in every dish! With resolve and her newfound ability to keep a cool head, Megumi prepares to face Ryo in the next battle: ramen. These opposite personalities clash through their dishes! The winner of Ryo and Megumi’s battle is announced. Immediately after that, the master of medicinal cuisine, Asako, goes head to head against the spices master, Hayama. Subaru Mimasaka has a habit of stalking people to get in their heads, challenging them to a Shokugeki, then taking their prized tools. Will Takumi’s mezzaluna be next? Soma’s semi-final match against Mimasaka is also a Shokugeki. With not only his tools, but also his future as a chef at risk, Soma prepares to fight Mimasaka’s version of him. The Shokugeki between Soma and Mimasaka begins! Immediately, Mimasaka’s mimicry of Soma’s dish comes into play. Can Soma beat this detail oriented “mirror” chef? The arena is filled with scarcely contained, feral tension as Akira Hayama and Ryo Kurokiba face off in the last round of the semi-finals. Soma finds himself in a strange place as the finals approach. Testing out recipes might be the last thing he has to worry about compared to the knowledge he lacks. In the last act of the competition, Soma's creation falls short. However, his dish has a secret twist, but is it enough to win against Hayama and Ryo's masterpieces? The Tohtsuki students are sent off for practical experience, and Soma lands in a (very) busy family restaurant with Erina's secretary Arata! Can these two even work together?! After the soft opening, SHINO'S has one more set of important customers for Soma to serve: Shinomiya's Tohtsuki Academy peers! The final act: the new menu item competition.